Sri Sri Ravi Shankar – Official Website	"My Vision is a Stress-Free, Violence-Free World"
Sri Sri Ravi Shankar is a globally revered spiritual and humanitarian leader. He has spearheaded an unprecedented worldwide movement for a stress-free, violence-free society. Through a myriad of programs and teachings, a network of organizations including the Art of Living and the International Association for Human Values, and a rapidly growing presence across 155 countries, Sri Sri has reached an estimated 370 million people. Sri Sri has developed unique, impactful programs that empower, equip and transform individuals to tackle challenges at global, national, community and individual levels. Born in 1956 in Southern India, Sri Sri was a gifted child. By the age of four, he was able to recite the Bhagavad Gita, an ancient Sanskrit scripture, and was often found in meditation. He holds degrees in, both, Vedic literature and physics. In 1982, Sri Sri entered a ten-day period of silence in Shimoga located in the Indian state of Karnataka. The Sudarshan Kriya, a powerful breathing technique, was born. With time, the Sudarshan Kriya became the center-piece of the Art of Living courses. 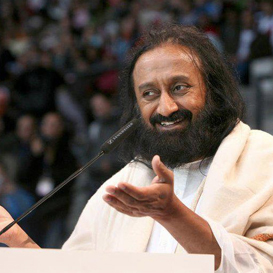 Sri Sri founded The Art of Living as an international, non-profit, educational and humanitarian organization. Its educational and self-development programs offer powerful tools to eliminate stress and foster a sense of well-being. Appealing not only to a specific population, these practices have proven effective globally and at all levels of society. In 1997, he also founded the International Association for Human Values (IAHV) to coordinate sustainable development projects, nurture human values and coordinate conflict resolution in association with The Art of Living. In India, Africa and South America, the two sister organizations’ volunteers are spearheading sustainable growth in rural communities, and have already reached out to 40,212 villages. Sri Sri has played vital roles in peace negotiations globally. From Kashmir, Assam, and Bihar in India, to Colombia, Kosovo, Iraq and Syria, and Cote d’Ivoire, Sri Sri’s programs have had documented impact on people involved in armed conflict to pursue the path of peace. In a world beset with escalating violence and conflict, Sri Sri is offering another path where individuals find peace within which becomes the wellspring for peace and harmony in society. For instance, thousands of Iraqis have benefitted through trauma relief programs since 2003. At the national-community level, Sri Sri’s programs have sought to address key societal problems. In the US, for instance, youth empowerment programs are tackling problems of gang violence, drugs and alcohol addiction in inner cities and schools. The celebrated Project Welcome Home Troops has provided life-changing trauma relief for US war veterans, recorded in documentaries. Sri Sri has pioneered and supported movements to revive ethics in public life such as India Against Corruption and the World Forum for Ethics in Business. In India, Sri Sri has started 618 schools offering free education to the underprivileged in the remotest of areas benefitting over 67,000 children currently equipping them to become productive citizens. Care for the environment has been one of the greatest areas of activity for the organization spearheaded by Sri Sri. 33 rivers and thousands of water bodies in India are currently being revived; the Art of Living volunteers have planted 71 million trees in 36 countries. The Art of Living Prison Program is helping to rehabilitate prisoners and has reached out to over 7,00,000 prisoners globally. For instance, in Uruguay, the Ministry of Interior has reduced the prison sentence for those prisoners who have taken the Art of Living Prison Program. Sri Sri’s vast global network of volunteers is well known for mobilizing trauma and disaster relief for affected populations around the world such as in Mexico, Haiti, USA, Germany, Canada, Nepal, India, Pakistan, Sri Lanka, Japan to name a few. At the individual level, Sri Sri’s self-development programs have helped hundreds of millions around the globe experience stress relief and a state of calm and well being. These programs are rooted in the ancient techniques of Yoga, customized for modern needs, along with Sri Sri’s unique offering of Sudarshan Kriya, a powerful breathing technique that facilitates physical, mental and emotional well-being. Independent medical research from reputed medical institutions has documented the impact of these techniques on the alleviation of depression, reduced cortisol (stress hormone) and strengthened the immune system. In a world torn apart by religious, social, national and cultural divides, Sri Sri’s overarching message is that the world is one family, and that diverse religions, cultures, and traditions are rooted in the same human values of love, compassion, peace, and non-violence. Mirroring this vision, Sri Sri convened the historic World Culture Festival 2016. The Festival brought together over 3.75 million people from 155 countries with spectacular performances on a breathtaking 7-acre stage by 36,602 dancers and musicians from around the globe, celebrating the diversity of all faiths and cultures. Sri Sri has been conferred with numerous awards around the globe, including the highest civilian award of Colombia, Mongolia, and Paraguay. The President of India has also bestowed upon him the Padma Vibhushan, the country’s highest annual award for exceptional and distinguished service. He has been conferred 16 Honorary Doctorates globally. Sri Sri travels to nearly 40 countries a year, with a simple but powerful message that love and wisdom can prevail over hatred and distress. 37 rivers and thousands of water bodies all across are being revived bringing ground water levels higher, benefitting millions of villagers. 16,550 toilets built, 3,819 homes, 1,200 bore-wells and 1,000 bio-gas plants. 27,000 youths trained in vocational and entrepreneurship skills. 760 villages electrified through renewable energy in remote parts of India and Nepal. More than 2,03,220 rural youth have been trained in leadership program who reached out with various development projects in 70,000 villages. 4,500 armed insurgents from extremist-affected regions of India de-radicalized, renouncing violence and reintegrating into mainstream society. More than 2.2 million farmers and youths from 22 states have been trained in natural farming practices. In Iraq, 50,000 people have been provided with life skills and trauma relief programs. 4307 Iraqi women have been provided with vocational training. More than 200 peace ambassadors have been trained to provide trauma relief to those affected. Since 2008, 73,432 students and 2,317 teachers have participated in the YES for Schools program in 147 schools across 22 states. 1,586 veterans and family members have benefited through SKY meditation workshops conducted through the Project Welcome Home Troops program, a restorative mind body resilience program for veterans and military members giving them tools to reduce chronic and post-traumatic stress. Since 1992, more 10,000 inmates, correctional officers and law enforcement staff have experienced the benefits of the PRISON SMART program, that effectively transforms the mindsets, attitudes and behaviors of offenders, thus aiming to break the cycle of violence at the root and reducing reoffending. Looking for Art of Living Programs?